Serenity has returned to Sisowath Quay. On April 17, 1975, in one of history’s most viciously bizarre moments, the Khmer Rouge army emptied Cambodia’s capital of its inhabitants. The entire population of three-million was forcibly evacuated into the countryside to perform excruciating manual labor in Pol Pot’s so-called “Killing Fields.” Most people traveled on foot. Those too weak to make the journey were shot along the way. High schools became torture chambers. Between 1975 and 1979, it’s estimated one out of every three Cambodians was either slaughtered, or died of starvation or exhaustion. With such a cruel past, I expected a harsh present in Phnom Penh. And I won’t be so naïve as to suggest life is happy for everyone there today. In the eyes of some older residents, you still see shock and sorrow. 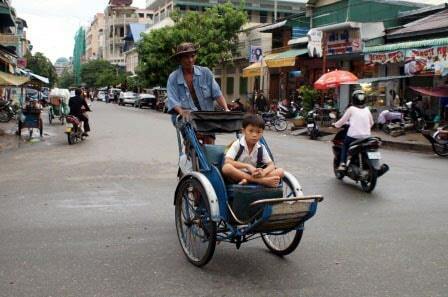 But on my first visit to Phnom Penh last week, I also saw an optimistic spirit in a city that is healing. Central Phnom Penh is once again vibrant – laid back yet cosmopolitan, with a picturesque waterfront where the Mekong and Tonle Sap Rivers converge. The cyclo is still a popular form of transportation. 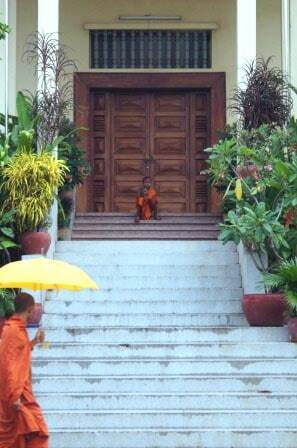 I’ve wanted to visit Cambodia ever since my first trip to Vietnam in 2008. I’ve been so enamored with Ho Chi Minh City (still informally called Saigon), it’s taken me seven visits to Vietnam before I managed to cross the border into Cambodia last week. Saigon is frenetic and traffic-clogged. With the right attitude, that chaos adds to the city’s charm. 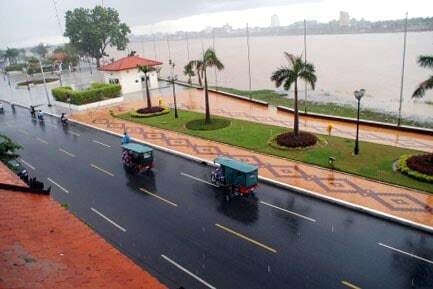 Phnom Penh, I discovered, possesses a different kind of charm, a mellow elegance with a street plan that’s organized and easy to navigate, and the most picturesque riverfront promenade I’ve seen in this part of the world. Along Sisowath Quay, a footpath flank the river for a couple of kilometers. 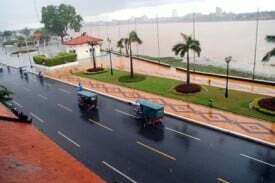 Across the street from the quay lie the commanding Wat Ounalom temple, the royal palace, and a long stretch of restaurants and hotels, where decent rooms with river views start at around 25 US dollars. In the evening, the quay feels energized with families enjoying dinner, kids playing soccer, and plenty of outdoor watering holes where you can grab a beverage and people-watch. 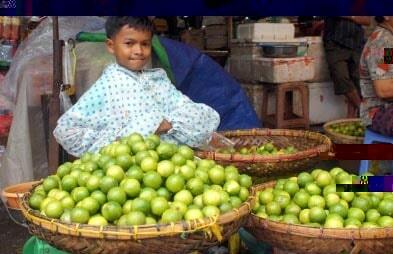 A boy sells limes in a Phnom Penh street market. A few blocks back from the river, an open-air market sprawls for several blocks, offering a wide range of meats and fish, fruits and vegetables. Farmers on motorbikes sell eggs from giant baskets. Local specialties include frogs and grasshoppers. Outside the city center, the government has opened two of its most infamous war-related sights to the public in an attempt to heal and remember the Khmer Rouge’s stunning genocide campaign. The Tuol Sleng Museum of Genocide and Choeng Ek Killing Fields are reachable by tuktuk (the ubiquitous three-wheeled vehicles that buzz through the streets). 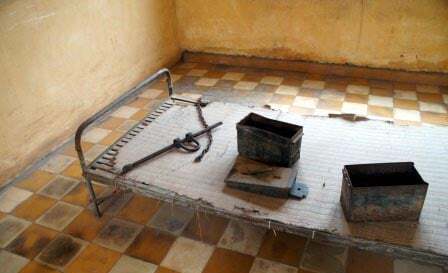 Infamous Tuol Sleng Prison has been converted into a genocide museum. Tuol Sleng started as a high school. When the Khmer Rouge forced residents out of the city center in 1975, they converted it to a prison and house of torture. The museum offers only basic information, leaving much to the imagination as you wander through classrooms that were converted into cells. The Choeng Ek Killing Fields offer more detail. Fourteen kilometers (nine miles) from Phnom Penh, Choeng Ek is where thousands of Cambodians were taken, often under the ruse they were being transported to new homes. Instead, they were often clubbed to death and dumped into mass graves. It’s one of many such places around Cambodia where it’s estimated more than two-million people were massacred during the Khmer Rouge era. We went during a pounding downpour that cast an extra layer of despair over the camp. As you walk, a stirring audioguide offers stories from those who survived. In heavy rains, human bones still rise to the surface of the mud. Visitors are asked not to touch them. Workers there collect and catalogue what they find. Monks linger outside Wat Ounalom temple. Assuming you’re a compassionate person, it’s impossible to visit such a sight without feeling sickened. But when you leave, and return to the city center, also take note that while ugly memories linger, the city is reemerging. A younger generation is looking forward. People are eager to connect with the rest of the world. They are warm and welcoming toward visitors, and tourism is contributing to their economy. I fell in love with Saigon on my first visit in 2008. It’s a city where I could happily live. I’ve now added Phnom Penh to that list. In spite of a chilling past, Phnom Penh is again full of life – an exciting place to wander and find joy in the present, while still acknowledging its chilling past. I found it perplexing at times to understand how a city could rebound emotionally after such a horrific trauma. But whether I understand the process or not is irrelevant. The fact is: they are doing it. That is what matters. Ask Dave: My Time in Cambodia is Short. What Do You Suggest?